An electro band from Sweden. TSS have been around since 2006 with various line-ups and released 2 singles via other labels already. In the first cold months of 2009 TSS recorded three new songs that were released through Cynical Minds Recordings this May. In its previous "reincarnations" the band was way less synth and electro oriented, but found the way to its contemporary sound in the course of time. It is melancholic yet danceable. I don’t mean it negative, but to my taste it is a bit too wishy-washy and there is a room for some more zip in those songs. It must be good as lounge music if played quietly, because it sounds not pushy and would have a relaxing effect. The influences of TSS range from the pop and rock scenes of the latter decades of the previous century. The title song deals with a topic that fascinated people since the beginning of the ages and I hope it always will: love. "Stalking Girl" is a rather slow-tempo song, sang as a monologue to an addressee. The remixes by fever society fix, Simon Gag and Captain Orange are rather interesting. Honestly I prefer the last remix of "Killers" over the original, while it is rarely the case with any song that the listeners find a remix more appealing than the original. I guess it is because this remix is more energetic and lively. 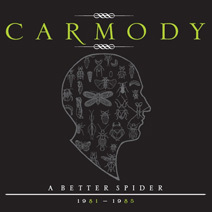 Active during the first half of the 80's Carmody were an electronic band coming from Torino, Italy. Started as a duo and later a trio with Massimiliano Casacci joining in as guitar player, the band recorded only a couple of demos and a song for a local compilation album titled "Tracce". That compilation gathered some of the bands active on that period in Torino and it has been compiled by Massimo Scabbia and named after the Tracce show that each Monday was aired by Radio Torino Popolare playing only Italian alternative music (the show was run by Fabrizio Della Porta and Gilberto Maina). Picking their name from a science fiction novel titled "Dimension of Miracles" by Robert Sheckley, the band did a perfect choice, because their electronic music wasn't exactly pop as, even being melodic, tracks like "Il sospetto", "Ambiguos" or "Cowboy" have a common feeling of imminent catastrophe. You know, like a dog who's feeling an earthquake coming or just like the Mr. Carmody of the novel who's lost in space. The synthesizers build strong ambience structures while Alberto Ramella theatrical vocals sing of the difficulties of being human beings. Picking seven out of sixteen tracks from the self titled demo, three out of six from their second demo titled "Dogu" (these ones thanks to Max Casacci sound less "dramatic" and have a certain pop potential) and a later version of "P.s.a.l.m." (the original one was on "Dogu"), "The perfect beat" coming from the "Tracce" compilation (one of their best electro pop tracks along with "Space invaders" and "Messengers of love") this compilation is a gem for the lovers of that period. If you loved the Monuments compilation issued by the label the last year and you want to discover their sister band (they were friends and Carmody also recorded at Monuments' TKS studio), this CD is a must! With the first 500 copies you'll find a postcard signed by all the three members. It’s seldom that a reviewer nowadays receives a real Single-CD with 3 tracks and moreover, that bands are seriously producing CD’s in this limited dimension. But this fits perfectly to the release catalogue of the Swedish Electronica-specialist VOIDE a.k.a. David Almgren. Combining the tradition with the newest media resources available to publish and present his music, has always been the main direction for VOIDE - and somehow this counts also for his music. 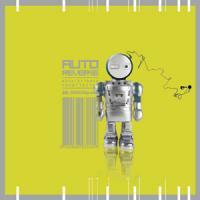 It is an Electronica/IDM-related outfit, which balances between the elements of EBM and Trance/Techno-influences. Sound-wise at the state-of-art, David integrates additionally a strong Pop/Wave-influence out of the good old 80ies and his sounds out of his beloved CZ-synthesizer family – you see, this stands rather more for the tradition. He also cant hide his dedication to the German pioneers KRAFTWERK by using comparable and vocoderized voice/vocal effects. But for "Love" the things differ. 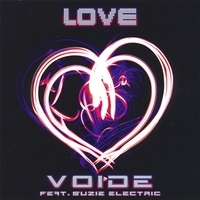 First off it needs to be mentioned, that "Love" isn’t at all a new composition of David – it sounds too much similar to David’s 2007 classic "Space Sponge", available on the same titled Voide debut album released in 2007. For this track, available in 3 different versions, he could hire Germany’s female artist Suzi Electric to provide the vocals. So you’ll get a version with lyrics in English and one featuring German lyrics. The third version is a mixture out of both languages, but it provides nearly 8 minutes of music. It seems a bit, that David felt the need to produce a real Extendet version of this sweet Synthpop-tune. A good collaborative idea and enough potential to become a favorite for every Synthpop-fan, but at least only a tiny shining light at the end of a tunnel, which is only a glimpse of the huge talent, which David has to offer. The idea behind this low price compilation is to celebrate the label by giving new life to Dekad, Celluloide and Foretaste songs (all of these bands have been reviewed here with almost every of their releases) by making other bands re-interpreting them (and between the various bands we have also the three aforementioned ones ). The interesting thing is that we don't have remixes but real covers and the good thing is that we have seventeen different songs. On the track list we have also some well known names such as Komputer, Sista Mannen Pa Jorden, Psyche + People Theatre, Joy Electric and The Rorschach Garden but also the ones that are new to me offer some great tunes. Even if we have seventeen different bands the label opted for an uniform result by inviting only electronic/electro pop projects. The best tracks to me are: Komputer version of Celluloide's "Incommunication", Joy Electric performance of Celluloide's "People like me", Even More version of Celluloide's "I missed you", Celluloide version of Dekad's "Dive", Foretaste version of Dekad's "Down below", Neues Kombinat version of Celluloide's "I am fine" and Destillat electro dark treatment of Dekad's "Club devil". This is a compilation worth the purchase anyway but it costs only 7, so give you a favor getting good music and... support the label! Equilibrium is sometimes like taking off your shoe in order to remove a pebble thrown unexpectedly inside of it and hurting feet while walking by a little spiteful brontosaurus. That could be just an interpretation of what this Italian band seems to suggest by the use of a nice shot for the green filtered cover artwork by Alessandro Della Savia (pay attention...there's a message under the leaves!) and inside and throughout the "rough" lines of an album which is only apparently just delightful and saturated with pleasurable grooves. Positive messages even if homemade and juicy tunes by the way! Let's state from now on that H.U.G.O. is just an acronym standing for Homemade (...and as many things with this distinctive quality, you could undoubtedly say it's greatly more genuine than any other musical prescription deriving from a widespread "serialism"! By the way... could you deny that fried noodles are healthier than Elvira Coot's delicious tidbits?!?) Unlimited Groove Opportunities and speaking generally you know there's nothing more concrete than opportunities (or could we speak about possibilities?!?). That's the reason why in my modest opinion, there's nothing particularly mystical or out-of-head in their music even if rich of references to some dreamy acts from Bristol music masters as well as ethereal "ambientalists" such as Boards Of Canada. But when the skilled voice by Daniela Zebra's uvula utterly flutterly sings, moans and (sometimes) whispers with total absence of fawning "life exists only in the absence of equilibrium", it seems that they enjoy being controversial and that's why they could not be defined a pop band! The lyrics are somewhat like memory pills as they even quote Herbert Marcuse's one-dimensional man, punks' believing, pagan principles based on the alternation of seasons and changes on human life, a bizarre female version of Stevenson's fictional character created to represent the splitting of personality (the famous '“ and not so '“ strange case of Dr.Jekyll and Mr.Hide), with some provocative statements (for instance in Whacked you could listen to a sort of gentle invective full of praises against an imaginary starlet totally absorbed by a "fake" star system ideology... ), while the music seems to be a conglomerate assemblage of different influences well amalgamated by a groovy cheeky rhythmical pattern, often invading the fertile grounds of psychedelic electronic movements with that way of "ease-grabbing" distinguishing poppy tracks, chiming tones and well-crafted basslines. Even if in some episodes the compositional aspects lacks of homogeneity, you'll arguably appreciate their trembling and sibylline style and their refined alchemy.